Perfect for even the largest groups. 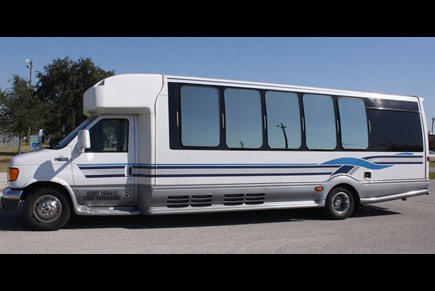 The exterior of this big white party bus has blue and gray accents that look stately and add a touch of elegance. However, step inside and you will be transported into another world! You'll be greeted with plush leather seating, multicolored lighting, hardwood floors, a dance pole, a wet bar, and an incredible audio system with subwoofers and even more to make for a night to remember! 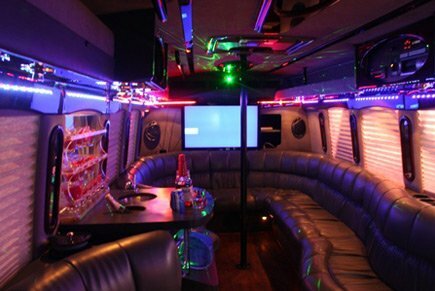 Throw back a few drinks and get crazy with Houston Party Bus Service!